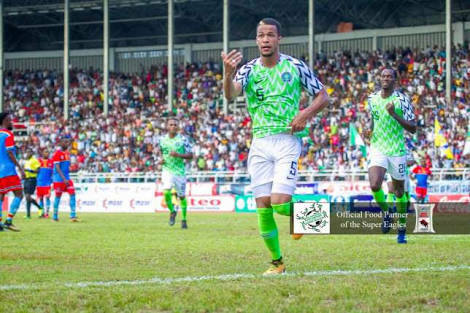 DR Congo yesterday forced the Super Eagles to a 1-1 draw at the Adokie Amasiemeka Stadium in Port Harcourt in a match, which served as farewell to the team’s supporters at home. The Eagles will fly out today for the last round of preparation for the World Cup in Russia. WilliamTroost-Ekong scored Nigeria’s goal in the 14th minute of the first half after a goalmouth scrabble, but DR Congo put up a credible performance, scoring through Malango Ngita with 11 minutes left to draw 1-1. Simy Nwankwo and Junior Lokosa were handed their debuts in the game, and Arsenal winger, Alex Iwobi replaced Kelechi Iheanacho in the 46th minute. Starting sluggishly, the visitors were on the ropes early on. Simy ghosted to the box and released a bullet, which hit the bar. But the Congolese fought back, with goalkeeper Francis Uzoho forced to stick out his legs to thwart Benik Afobe from close range in the seventh minute. The opener arrived in the 14th minute. Ogenyi Onazi’s floated free kick wasn’t well dealt with by the Congolese defenders. The ball arrived at the path of Ekong who applied the finishing touch.Debutant Simy was menacing in the game despite being starved of service. The striker delivered a brilliant header from Ola Aina’s long thrust, which forced goalkeeper Anthony Mossi to a save. A golden opportunity by Iwobi to put Nigeria ahead in the 33rd was also wasted.DR Congo pressed forward for the equaliser late on and attacked with intent. Mpeko was denied from close range by Uzoho. And that warning sign wasn’t heeded by Nigeria, who paid dearly for it. Aina, who replaced Echiejile at half-time, should have let it go, but he hauled down Mpeko and the referee pointed to the penalty spot. Malango Ngita sent Uzoho the wrong way for the leveler. The match witnessed a mammoth crowd who thronged the stadium to have a glimpse of the team before their departure today to London to honour a friendly against the Three Lions of England on June 2.Super Eagles coach, Gernot Rohr said after the match: “It was a very tough game. The DR Congo team made it difficult for our boys. We will make adjustments in our areas of weakness.